Here we go with week nine... pretty much an ordinary week except that we were given a vintage typewriter! When you think you don't have too much going on and you worry that you'll never have enough pictures to complete a layout, remember there are always every day moments just waiting to be documented - lunch, nephews, a breakfast out at chick fil a, a turtle encountered on a walk, a room in your house. Just look around and I'm sure you'll find plenty of worthy subjects. This is what I love most about Project Life, documenting the every day. I included an instagram pic of the typewriter and just above it a note that Mason typed for me. He was having fun typing random words so I handed him a plain journaling card and told him to type whatever he wanted on it. I love the little note he typed to me! I thought it would be a good idea to include a picture of each room in our house throughout the year. This time it was my kitchen. I love using the number stickers for bullet points when I don't have a lot of journaling. I documented leap day with some gummy bears in the shape of the number 29. 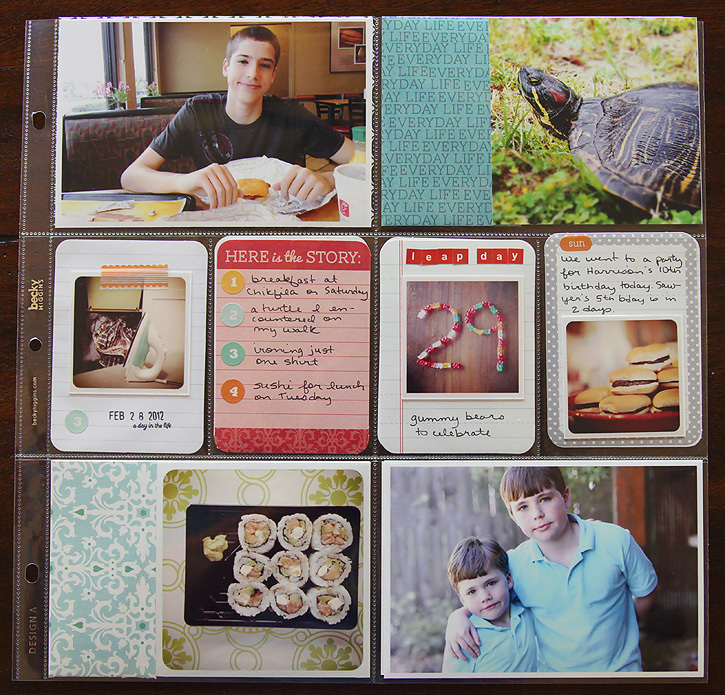 Check out The Mom Creative for more Project Life sharing. Great pages. And really great pictures! Love that little turtle! 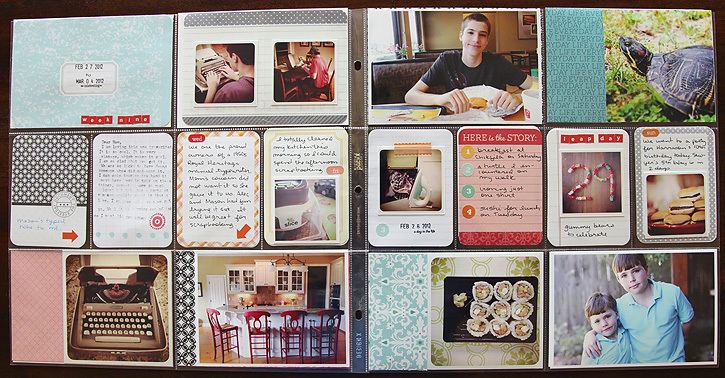 I always love looking at your Project Life pages! It's so fun! I think it's so neat you guys got a vintage typewriter. I remember my parents having a typewriter when I was a kid and how much I loved using it. It would be fun to use one now I think. Also, I love your kitchen! It's so bright (I want a white kitchen) and I love the red chairs!! I love your pages! Your layout is so clean and simple, yet still has personal, creative touches. Beautiful! I also love that "Here is the Story" card where you added the number stickers. Love your pages Deb. The typed note is fabulous - what a great idea! Love this spread. I really like how you have a typed note from your son. 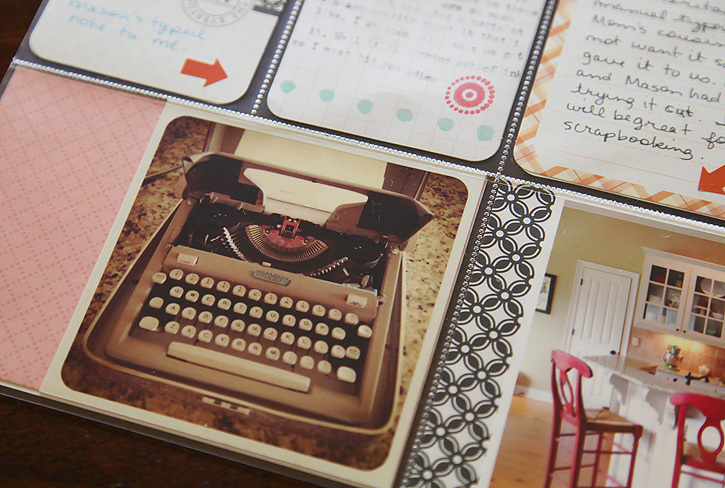 Love the typewriter insert! I love the pastels with the punch of red/black, too. love your album. really beautiful photos. 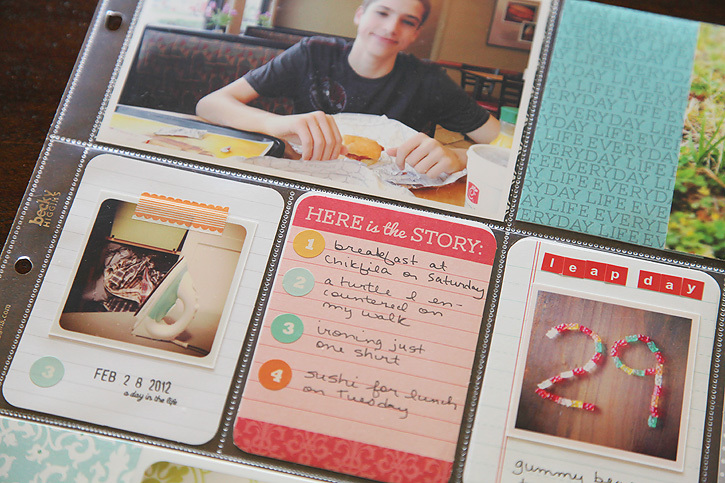 and i totally agree - this project is great for capturing those wonderful everyday moments. Perfect example of how to capture ordinary life. Wish we had turtles like that around here. My boys would love it. Cool typewriter and red stools in your kitchen. 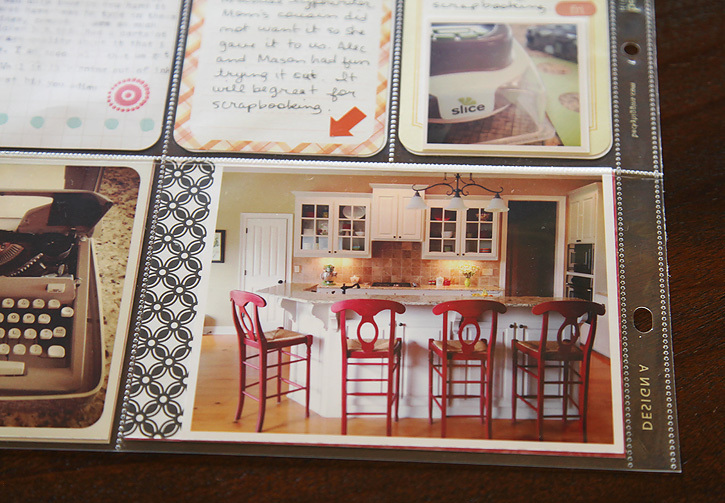 I have red stools around my island too ;0) Great extra lottle pictures you added to the journaling cards--perfect touch. I love this Deb- 10 years from now the boys & their families are going to love looking through these. BEAUTIFUL kitchen!! I love your kitchen! Those red stools just pop out! I may take a page frmo your book and werite the week on the title card, somehow! Such fun. Love your pretty red kitchen stools, and the creative leap day bears. Love your kitchen! What a great idea that is to include it! I found a super cute typewriter at a junk store this weekend but it didn't have all the buttons :) the note your son wrote is great! love your pages...I'm so glad it is PL tuesday! I remember my dad writing his master's thesis on a typewriter. I would have never made it through college if I had to use a type writer. 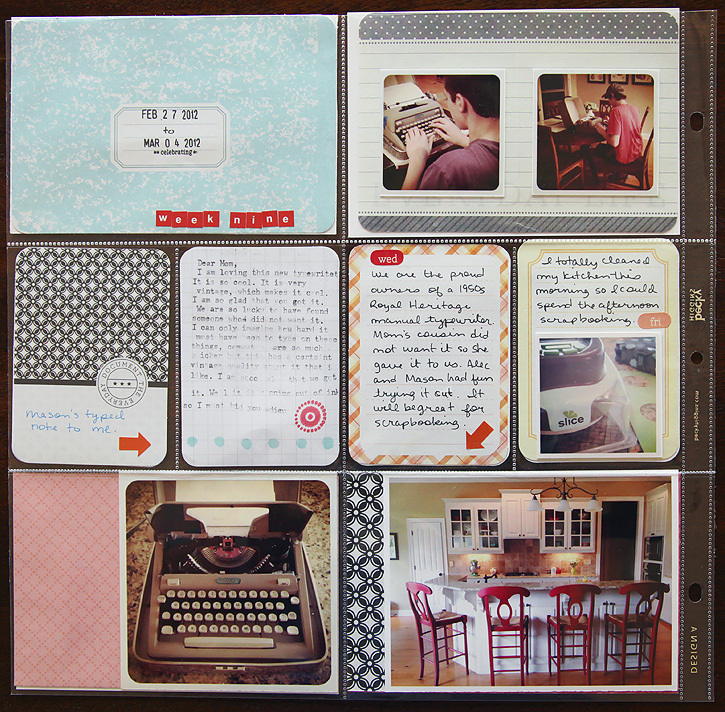 So it's really amusing (not in a bad way, it a good way) that people use them in their scrapbook. You make this seem so easy! I'm sure I would stare at the pocket pages and wonder what to put in them lol. I love have you make the everyday so interesting. Your son's note is so sweet. Love your pages, Deb!! You always have really great creative ideas while still keeping it simple. I love it! Loved how you included a little something from one of your sons this week, that is so special. Also like your idea of including one room in your house throughout the year. Beautiful kitchen by the way, love the bar chairs!! love your handwriting and your small square photos! the colors too are awesome! Thanks for sharing your photos each week! Oooh to the typewriter, and made even better with that typed note from your son! 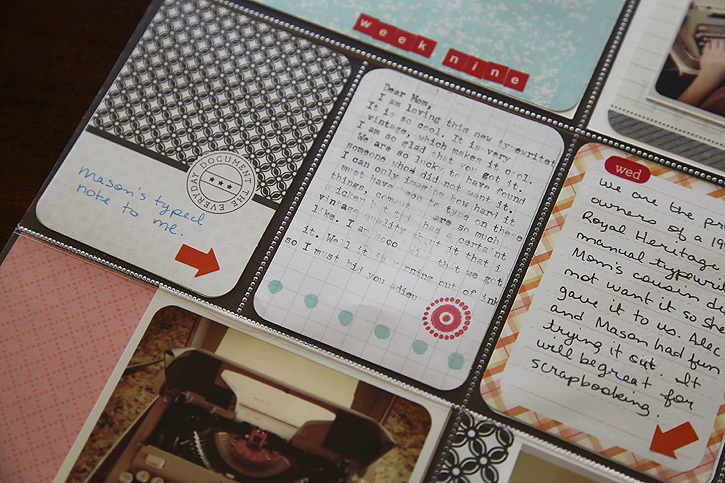 I love the numbers for bulleted journalling I must try that! Vintage Typewriter, I recall having a similar one as a gift for one of my teenage Birthdays. You should see what I consider to be a vintage typewriter, ha ha! I wish I could do pages like that. Okay, I love your kitchen! You always do such a great job with your Project Life book. I love your keep it simple approach. Perfect note with the typewriter. That is so sweet. I love how you put the date on a ticket. I also love your new vintage typewriter! lucky girl! Love, love, love it! Thanks for sharing your inspiration! (BTW, I learned to type on one of those old manual typewriters!) ha!